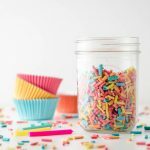 This recipe for homemade keto sugar-free sprinkles makes sweet and crunchy rainbow sprinkles to decorate cupcakes, cookies or any baked goods. Low carb and keto friendly! Why make sugar free colored sprinkles? 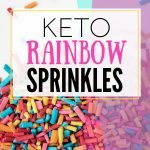 A few months ago I needed rainbow sprinkles for a recipe. For some reason, I thought the number of carbs that regular rainbow sprinkles would contribute would be negligible. WOW, was I ever wrong. I almost couldn’t believe the nutrition label – a whopping 4 carbs in every teeny tiny teaspoon. What exactly are rainbow sprinkles made of? They’re little sugar and starch bombs! 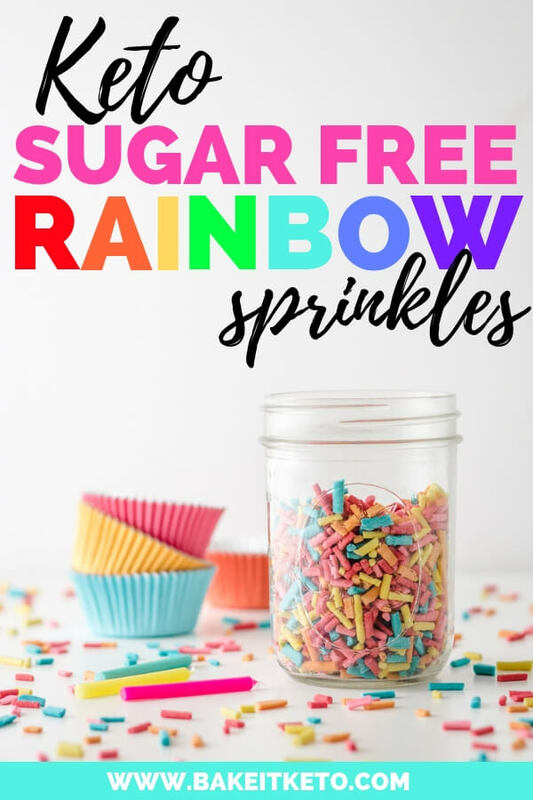 The first few ingredients in these Wilton Rainbow Sprinkles are sugar, cornstarch, hydrogenated palm kernel oil, dextrin, and carnauba wax. So are rainbow sprinkles bad for you? Well, if I’m taking the time to make a delicious homemade keto friendly low carb cookie or cupcake, there’s no way I’m going to add an extra 4+ carbs to every single cookie with commercially made sprinkles. Totally not worth it. But just because we’re eating keto doesn’t mean we should miss out on a funfetti cake or adorable holiday cookies! So that’s why I created my sugar-free sprinkles recipe. Making healthier sprinkles without all the sugar is much easier than you’d think. You’ll make a very simple sugar-free royal icing that is on the thick side, and pipe it into lines. Don’t let the piping scare you! I went very quickly and my lines were far from perfect, but I still ended up with around two cups of adorable and cheerful rainbow sprinkles. If you don’t have piping bags or tips handy, just use a quart size zip-top bag with the very tip of one corner cut off. No need for perfection! 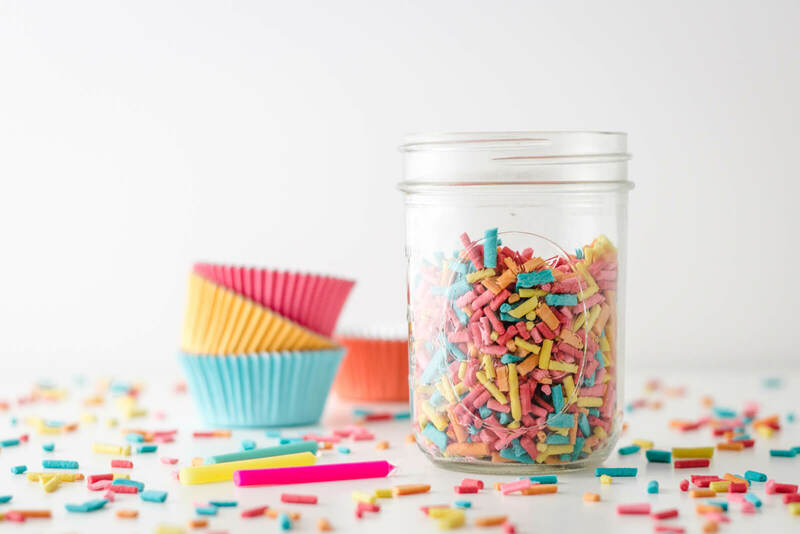 If you aren’t using a piping tip, don’t try to make your sprinkles super thin. It will be much easier if you make slightly thicker sprinkles like I did. Add the egg whites to the bowl of a stand mixer fitted with a whisk attachment. Add the confectioners Swerve and slowly combine with the mixer on low speed, scraping the bowl down regularly. Add the vanilla and lemon juice and continue mixing on low speed to combine. Once the confectioners Swerve, vanilla, and lemon juice are fully incorporated, turn the mixer to high speed and whip until the royal icing becomes light in color and slightly fluffy. Line several sheet pans with parchment paper. Alternatively, you can simply lay the parchment out on any table or other surface where the sprinkles can be left to dry overnight. While you are mixing the colored icing and piping the sprinkles, keep a damp kitchen or paper towel over the rest of the uncolored royal icing. It dries very easily and the crusty bits will clog your piping tip. Working with one color at a time, scoop out some of the royal icing into a small bowl, and mix in your choice of food coloring. Transfer the colored royal icing to a piping bag fitted with a small round tip. Choose the tip based on how thick or thin you want your sprinkles to be. No pastry bags? Use a zip-top bag and cut the tip off of one corner. Pipe the royal icing out onto the parchment in long parallel lines. There is no need to be perfect! Feel free to go very quickly and don't worry about bobbles and squiggles. Allow the royal icing to dry for several hours, preferably overnight, until very dry and crunchy. With clean hands, break the dried icing strands into sprinkles. I like to pick up a bunch of the long strands and break them like spaghetti. Store the sprinkles in an airtight container. 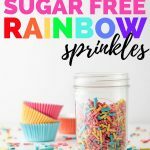 WANT TO SAVE THESE KETO SUGAR FREE SPRINKLES FOR LATER? CLICK HERE TO PIN THIS RECIPE TO YOUR FAVORITE KETO PINTEREST BOARD!